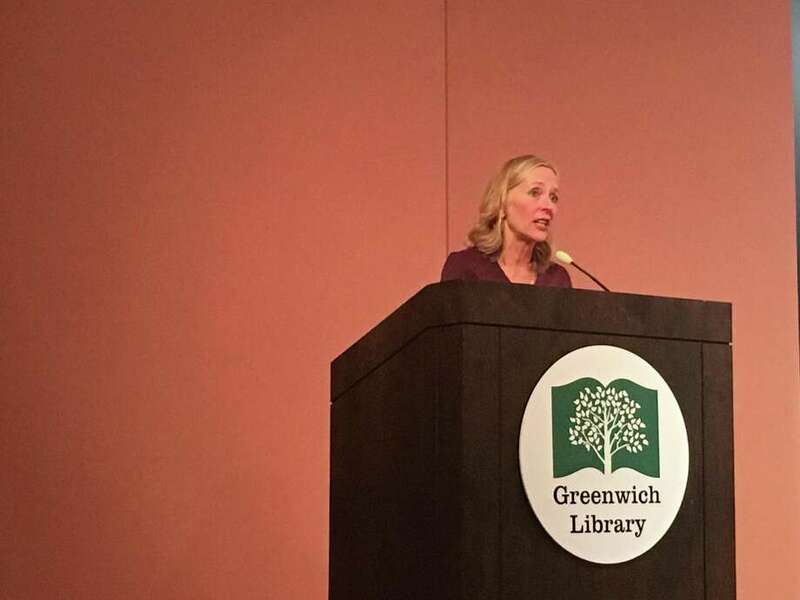 'Code Girls' author Liza Mundy speaks Wednesday night at the Cole Auditorium as part of the Greenwich Reads Together event. GREENWICH — The young, graduating women wore white and cradled flowers in a 1942 portrait of Goucher College’s May Court. For two of them, life would change forever with just two questions. The women who answered “Yes” to the first and “No” to the second would later become the code-breakers who shortened the United States’ involvement in World War II by one year and saved countless lives. But no one knew about them at the time. The government had sworn them to secrecy. The Goucher women and others like them tell their stories for the first time in “Code Girls,” the book Greenwich Reads Together chose for 2018. Award-winning author and former journalist Liza Mundy captivated her audience at the Cole Auditorium of the Greenwich Library Wednesday night as she told listeners about her book, the culminating event in a series of community programs based on the work. “Code Girls” is part of a trend in books and movies that tell stories of important minority involvement in American history. Mundy referenced “Code Talkers,” the story of Navajo Indians recruited by the Marines to develop an unbreakable code that clinched American victories in the South Pacific, and “Hidden Figures,” about the African-American women who were the brains behind launching astronaut John Glenn into space during the Space Race. “I think there’s a new receptivity to the role these groups played in U.S. history,” Mundy said. Mundy explained the prejudices facing women who yearned for higher education in a culture fixated on marriage, and how code-breaking offered to women the chance to deviate from the mold and serve their country. Anderson read “Code Girls,” and later learned the library recommended middle schoolers read Mundy’s version for young readers. She is glad she opted for the advanced level, however, even though it took her a long time and she did not understand some parts. “These 10,000 women got so far with no one knowing at all how this war has been affected by them,” she said. The women who comprised more than half of America’s code-breaking forces never received any credit after the war. Congress recognized a group of code-breaking men soon after the war, effectively writing women out of history, Mundy said. The government prevented the women from talking long after it declassified memos with information about their contributions — because it never told them they could speak up. “No one bothered to tell them that they could tell anyone,” Anderson marveled. She was not the only member of the packed audience captivated by Mundy’s talk. Her mother graduated during the time of book’s setting, 1943, and Jackson attended Chatham Hall, a private school in the same town as Chatham High School, where one of the code breakers taught. The societal expectations the code girls faced, such as earning an “Mrs. Degree” during college, feel so remote, she said. “History seems so short when looking at it from this side,” she said.